Nearly every nation in Sub-Saharan Africa has faced power traps and institutional instability since their independence from European colonialism. Over the past four decades, Rwanda and the Democratic Republic of Congo (DRC) have confronted both internal crises and constant external threats. The two nations have been intertwined in ethnic and political conflict since the end of the Rwandan genocide in 1994, when nearly 2 million Hutu fled to eastern Congo fearing reprisal from the Tutsi-led Rwandan Patriotic Front (RPF) that retook the government. On August 4th, President Paul Kagame of Rwanda was reelected to office for his third term, winning over 98% of the vote. An amendment to the constitution allowing for Kagame to run for a third term was introduced in 2015 following a popular petition that received 3.7 million signatures (more than 60% of registered voters). Though Kagame is popular for his role in economic reform, improving healthcare and education, and reducing internal violence in Rwanda, there are major concerns that he is stamping out opposition movements and that there is no protected space for other parties to develop. One opposition party, FDU-Inkingi, has been outlawed and its candidate in the 2010 election is serving a 15-year prison sentence for threatening national security. In addition, the Green Party’s Vice President was beheaded in 2010, leading up to the election. In this year’s election, most other parties did not put forward a candidate, supporting Kagame based on his successful policy and broad national popularity. The DRC, far larger and varied in comparison, has over a dozen active parties and the incumbent is an independent. In the Democratic Republic of Congo, two successful democratic elections have taken place since its latest revision of the constitution in 2006. Joseph Kabila was elected in 2006 and reelected in 2011, but in 2016 was due to be replaced in a national election due to the established term limits. However, in September of 2016, the electoral commission announced that the election would be postponed to 2018 because a census was needed for the proper implementation of the election. The announcement caused international concern for the future of Congo’s juvenile democratic institutions and roused internal protest and conflict with opposition leaders, familiar with the modus operandi of the power-grabbing presidents of the past. 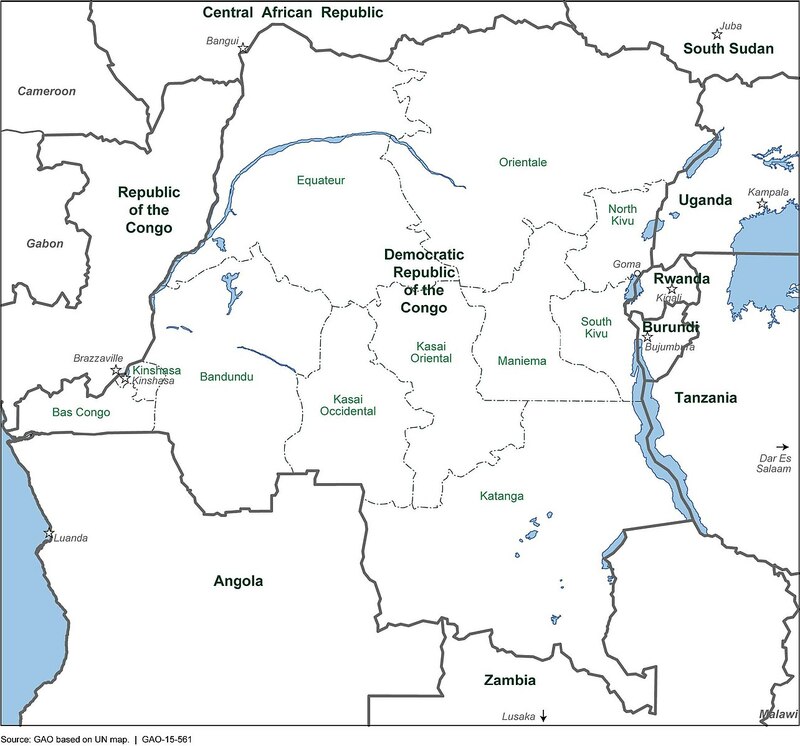 Map of DRC, its provinces, and adjacent countries. Most violence occurred in North and South Kivu. Approximately 5 million people perished in the conflict between 1994 and 2003 often referred to as Africa’s World War, in which soldiers from nine different countries clashed on Congolese soil. In 1996, the First Congo War officially began when Rwanda and Uganda invaded eastern Zaire (later the DRC) to stamp out perpetrators of the genocide and eliminate any threat of an invading Hutu force. Laurant Kabila overthrew the infamous ruling dictator Mobutu Sese Seko with the support of the two armies. He became president in 1997 and soon after ordered the two armies out of the Congo, fearing that Rwanda and Uganda would seize the mineral-rich areas of eastern DRC. Kabila received support from a number of regional partners, including Angola and Zimbabwe, in the Second Congo War, as Rwanda accused Kabila of ambivalence toward rooting out the Hutu rebels. In 2001 Laurant Kabila was assassinated, but his son Joseph Kabila was appointed president in his place. The conflict officially came to a close in 2003, but rebel groups with various aims and allegiances have endured in eastern Congo. A persisting trend in the conflict is Rwanda’s clandestine support of Congolese rebel groups that seek to overthrow or secede from Congo’s government and put an end to Hutu rebel groups operating in the DRC. In 2008, however, Congo and Rwanda led an assault against the Hutu rebels, ending a proxy war between Tutsi (the National Congress for the Defense of the People – CNDP) and Hutu (Democratic Forces for the Liberation of Rwanda – FDLR) war bands in eastern Congo. As part of the agreement the CNDP split in 2009, with half of the group integrating into the Congolese national army and the other half resisting, forming the new rebel group M23 in 2012. The leader of M23, Bosco Ntaganda, surrendered to the International Criminal Court’s custody in 2013. This has not spelled the end of conflict in the vast region of eastern Congo, as a handful of rebel groups continue to war with different governments, each with varying aims: the FDLR continues to operate, 2,000 combatants strong; the Ugandan Allied Democratic Forces (ADF), made up of 500 Islamists, seeks to initiate Shari’a Law in Uganda; the Ugandan Lord’s Resistance Army (LRA) is led by cult leader and self-proclaimed prophet Joseph Kony, who seeks Christian rule in Uganda; the Burundian National Liberation Forces (FNL) is a Hutu rebel group in alliance with FDLR and Mai-Mai Yakutumba; and various Mai-Mai militias, numbering six in total. The issues that plague Rwanda and Congo are very different in nature. Foreign forces ruled Rwanda for nearly a century, first the German Empire and then Belgium. Before German colonization, there was a strongly centralized government that stretched over today’s Burundi, Rwanda, and Uganda. Hutu and Tutsi mostly shared rule until the 18th century when the Hutus in administrative and bureaucratic positions began to lose power and become marginalized. Hutus, which made up the large majority of the population (an estimated 85%), were mainly known for cultivation while the minority Tutsi were known as pastoralists, owning valuable cattle. As the centralization of the kingdom continued, land was distributed to individuals rather than through lineage groups (which would favour the Hutu majority), and thus Tutsi chiefs were increasingly selected. This led to increased inequality between the groups. The social and political dynamics only worsened with German indirect rule, as Tutsi political power became entrenched with the support of the Germans. The Germans believed that the Tutsi were purer and the closest ethnic group to Europeans, introducing a racialist ideology that did not exist before European intervention. With the introduction of money, individual taxes, and larger organizing capitalist forces, the power-distance and influence of Tutsis began to decrease. It became clear that the Tutsis did not bring any inherent value to governing the country, and were simply being controlled by the European foreigners. Following World War I, Belgium was granted rule over Rwanda. The popular trends of eugenics and biological racism in Europe and the United States were introduced and enforced in many colonies. In particular, Belgium sought to identify the biological and racial differences between Tutsis and Hutus, subjecting tens-of-thousands of Rwandans to tests and measurements by European scientists. Following 1935, racialist ideology was standardized and normalized with the introduction of ethnic identity cards. Before the arrival of Europeans, social groups were more fluid with wealth and vocation defining one’s class. Following European rule, an unfounded racial divide was developed and instrumentalized for the purpose of colonization. These factors contribute to a growing historical and ethnic conflict that plagues Rwanda to this day. In contrast, the majority of today’s Congo was never ruled by centralized kingdoms. King Leopold II of Belgium created the corporate state the Congo Free State in 1885 without the knowledge of most of its inhabitants that were spread across the region, mostly living in local groups. For 23 years, the Congo was plundered, rebellions from various local groups were put down, and little development took place that wasn’t geared toward resource extraction. An estimated 10 million people (half of the total population) were killed or died from starvation and disease. In 1908, Belgium took control of Congo from Leopold, following an international outcry and activism mission to bring to light the ruthless violence ordered by King Leopold and his personal gain from the colony. Though executions and mutilations were put to an end, the country was largely privatized and exploited for its natural resources and fertile land. Each region was administered individually and became specialized based on the type of economy it was best suited for (mineral extraction, plantations, etc.). Shortly after the DRC’s independence, military leader Mobutu Sese Seko led a coup d’état with the support of Belgian forces against the first democratically-elected leader, Patrice Lumumba (feared to be left-leaning or an outright communist). Seko would rule for 32 years through kleptocracry, nepotism, public executions, consolidation of the military, establishing a single-party state, and support from Western countries. Despite the well-known use of coercion, execution, and a multitude of human rights violations, Western states (namely the United States) supported Seko’s government for access to the valuable uranium deposits used for producing nuclear weapons in the Cold War arms race. The democracies of the West overlooked Seko’s dictatorship and even outright supported it in the fight against international communism. As dictator, Seko severely mismanaged the economy and caused massive inflation, enriching himself and his ruling circle in the face of mass poverty of Congolese citizens. He enticed foreign companies by limiting taxes and royalties on extracting natural resources. Continued poverty and low quality of life came in the wake of Congo’s size, historically undeveloped infrastructure, and lack of government programs and robust policy to support civilians. Pervasive corruption and continuous warfare have hindered the nation’s prospects for economic development and democratic representation. The UN peacekeeping forces first entered the conflict following the ceasefire in 1993 during the Rwandan Civil War, as the United Nations Assistance Mission for Rwanda (UNAMIR). When the genocide was unleashed a year later, the UNAMIR was completely unprepared, and due to its limited mandate, did not take measures to defend the Tutsi minority or end the attacks. Many countries supporting the mission requested to back-out and allow Rwanda to deal with its internal crisis alone. UN and international action was too little and too late; as the details of events emerged in the aftermath, the UN intervention was recognized as deeply flawed and an overall failure. A report by the Centre for Systemic Peace has documented that as the Cold War came to an end “post-formation instability” increased significantly. It points to the increase of media coverage and proliferation of light weapons following the Cold War. While South Africa stabilized and rebounded politically, Central and Eastern Africa “remain highly unstable and volatile.” In July of 1999, the United Nations Mission in the Democratic Republic of the Congo (MONUC) was established to observe the ceasefire signed between the DRC, Angola, Namibia, Rwanda, Uganda, and Zimbabwe. These countries have been affected by neighbourhood spillover effects (large refugee and displaced populations), issues in leadership succession and mismanagement of the state. In early 2000, the main goals were established in UN Security Council Resolution 1291. They included: liaison between the warring parties, ensuring the disengagement and deployment of armed forces, observing breaches to the ceasefire, and supporting the exchange of prisoners of war. Between 2000 and 2004, the peacekeepers worked to end violence emanating from the central provinces and moving eastwards. Each year the mandate expanded slightly and the maximum number of military forces was increased. 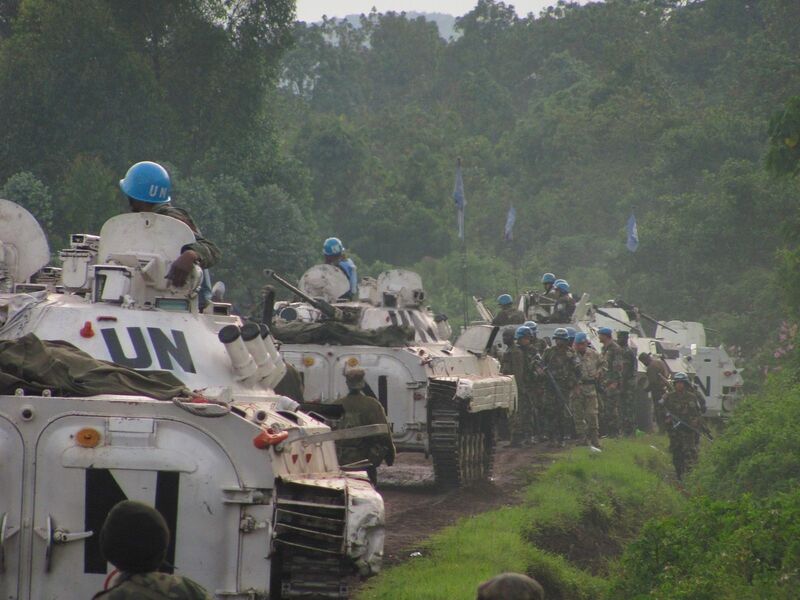 Following the end of the Second Congo War in 2003, the UNSC Resolution 1565 authorized 5,900 additional forces to be deployed in the areas of North and South Kivu, bordering Rwanda and Burundi. The modified mandate of R1565, which continues to today, includes: contributing to the pacification and general improvement of security in the country, providing support for conflict resolution in politically volatile areas, and improving border security – patrolling and monitoring of the arms embargo. In 2010, MONUC was replaced with the United Nations Organization Stabilization Mission in the DR Congo (MONUSCO), highlighting the reduction of conflict and new period of stabilization in the country. The mandate focuses on protecting civilians, humanitarian personnel, and human rights defenders from imminent physical violence and supporting the government in its stabilization and peace consolidation. In 2013, an “intervention brigade” was created, lasting two years, to neutralize armed groups that opposed the state and endangered civilians’ security. The troop ceiling reached its highest point of 19,815 soldiers, and in March 2017 was reduced to 16,215. Though it is difficult to measure the effectiveness of UN involvement, it is more difficult to imagine an alternative force that could intervene in a responsible and organized manner. Had pacification and stabilization of the country been left to the Congolese government, their success would be severely limited by available resources, undeveloped infrastructure and training of personnel. It would also likely have involved a greater loss of life and human rights violations. The DRC and Rwanda’s long road to democracy has not taken an ideal or practical course. Rwandans and Congolese have been subjected to rule by force, authoritarianism, and corrupt governments. A transition to democratic institutions and principles will not be easy; democracy is bureaucratic, time-consuming, and easily degenerates into populism and majority rule. Without a strong economy and incentives to participate, the average citizen in these countries will focus on pursuing more immediate needs, such as food, housing, and education, and rightfully so. Without proof that democratic representation will actually take their views into consideration and prioritize their needs, civilians will remain suspect of democratic institutions. Most of all, officials in government must respect the separation of powers and branches of government that protect against one-man rule, corruption, and treason. 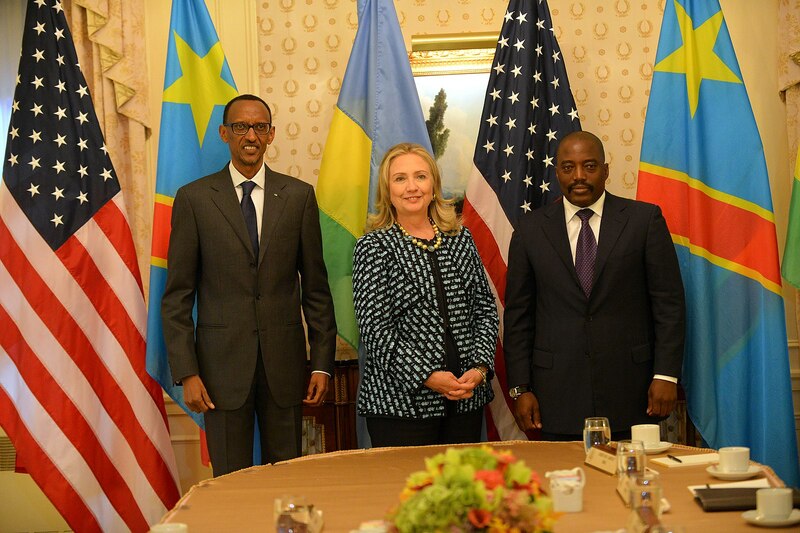 Will Paul Kagame and Joseph Kabila have the prudence to relinquish power as democratic institutions require? Will they realize that staying in power damages rather than improves their countries and the foundation of their governments? More importantly, will other representatives come together to denounce power-grabbing presidents and will a transition be achieved without bloodshed or military suppression? These are the questions of the day, the answers to which will determine the fate of democracy in Rwanda and the Congo. Nick is double majoring in History and Economics for his Bachelor of Arts degree. In his third year at McGill Nick is most interested in American politics, the international economy, and historical implications to the changing world.